Here is the bag I made for my friend’s charity raffle. I used the book, The Better Bag Maker, by Nicole Mallalieu. There are a number of reasons I like this book. 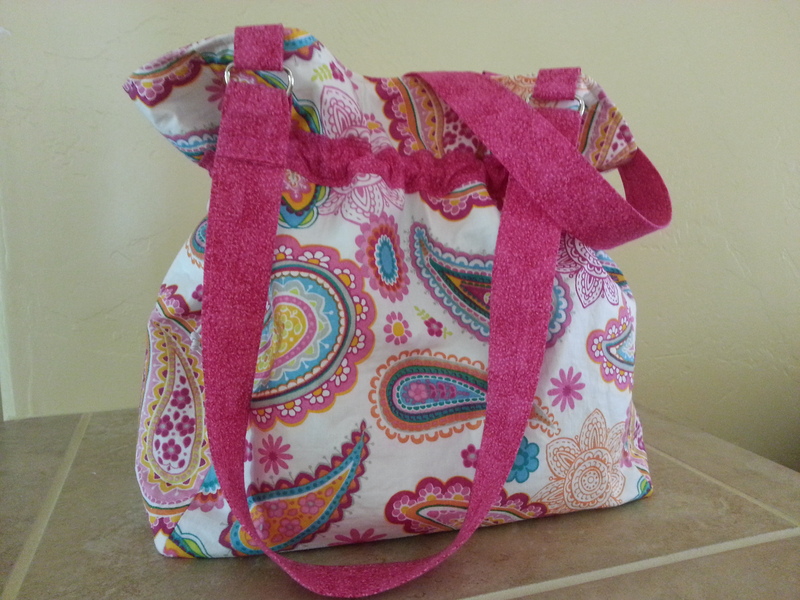 The first half is filled with great techniques including excellent ideas for giving your homemade bags a professional finish. The second half is a series of projects that are organized so that you build a new skill with each bag. Remember math? Learn how to add before you multiply. I love math, so this concept was an easy one…..except I didn’t follow it. Went straight to project number 2. I’ve made a few bags in my life, so what could go wrong? Well, not really understanding the construction as it is a little different from anything I’ve done. Would have got that down in project 1. Then there was the time I spent redrafting the pattern so that I didn’t have to copy the pattern. Much easier to use a rotary cutter; and it was. Problem was that I was on a time crunch and no one would have known if I made the bag bigger or smaller than the pattern called for. (side note: another great thing about this book is that she teaches you how to adjust pattern sizes to your liking/needs/whim/whatever.) Great lesson, but again, if I had done project 1, the bag could have been done in less than a day. A few blunders, but the end result is exactly what I wanted. Then there was the weather. Living in the Southwest, we are in the middle of Monsoon Season. Thunder and Lightning almost daily and usually late in the afternoon. 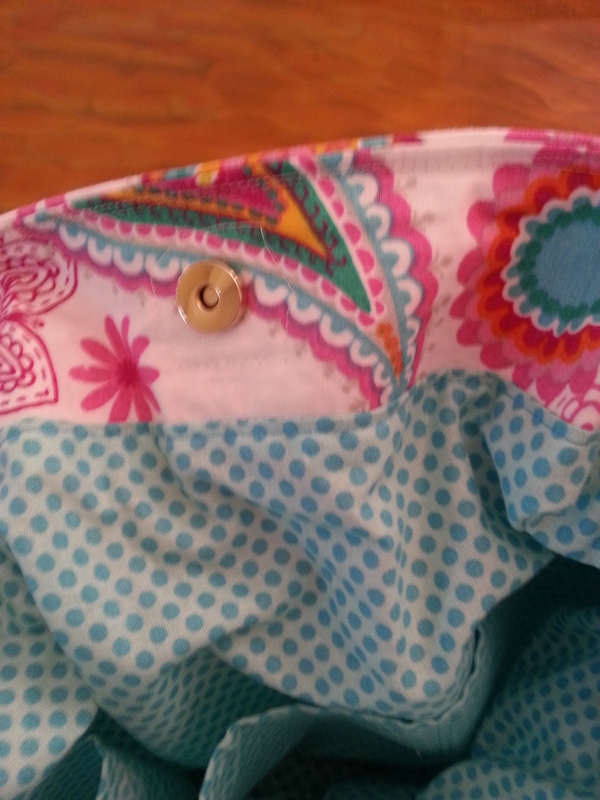 I like to sew in the afternoon. OOOPS; didn’t factor that in and lost an entire afternoon and evening to a storm, which also left me with some extra water in my bathroom. NOT FUN. All in all, it was a weekend well spent. I learned a few techniques, picked up a trick or two, and was able to present my friend with a homemade summery bag, that doesn’t look so homemade. To top that, it’s almost the end of July and I am more than half way to my goal for the year. Here’s the photo of the top and inside “professional” finishing. 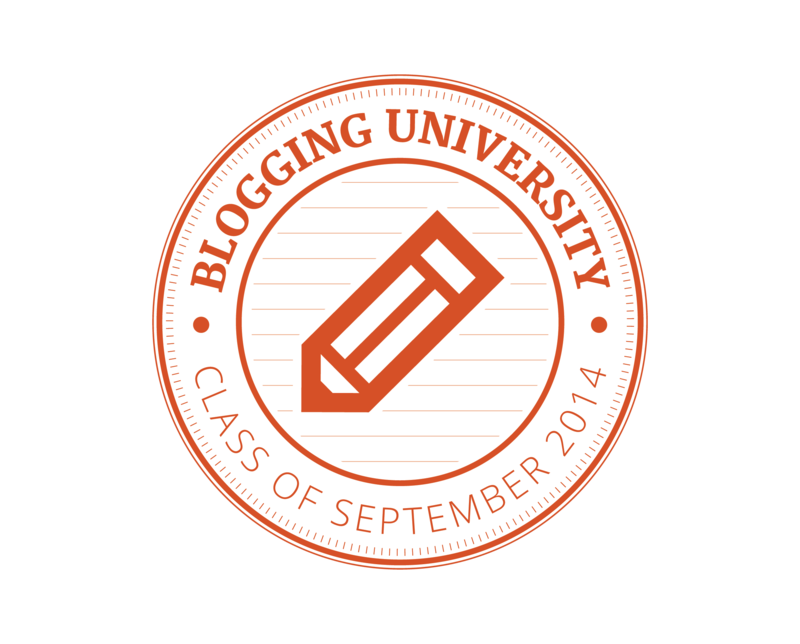 This entry was posted on July 13, 2014, in Quilting. I have made it half way to my goal of completing a project a month. Dance if you wish. This quilt is from a pattern called “Crooked Mile” by A Quilter’s Dream. I have seen this quilt in many color ways, but I must admit the more contrast you use in your color choices, the better you can see the pattern. 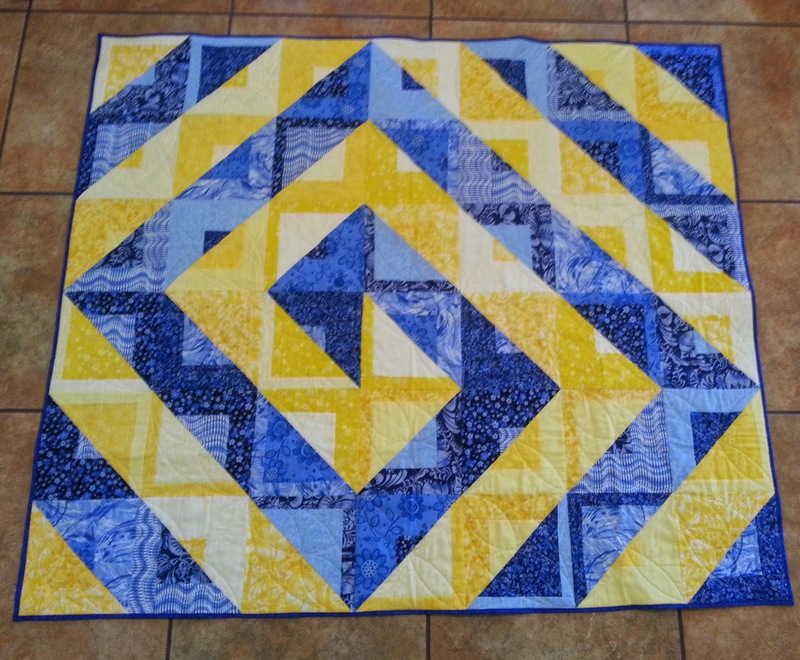 Using only blue and yellow in a quilt was on my list of things to make, so now I can check that one-off! This really is a fun quilt to make and I think you get a big bang for your buck. Now a short lesson in fabric. I purchased the required amount of fat quarters at a popular chain store. Fat Quarters (18″x21″ or something close) were on sale, plus a special coupon; who could resist? Not I. Having already made one of these quilts in black, white, and red I knew it would be a great pattern for blue and yellow. I justified my purchase by knowing I wouldn’t keep this quilt and that it would probably end up being donated. Well, you really do get what you pay for. I won’t get into the details now. Let’s just say that not all quilting fabric is equal. You meed to ask yourself if the extra care involved is worth the lesser price. Must put that on my to blog about list. 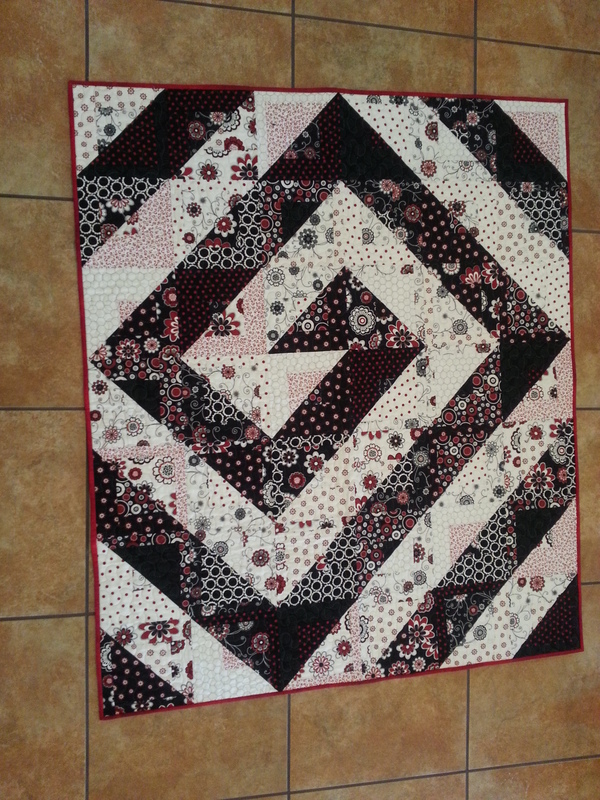 When it was time to quilt, I loaded it on my Bernina frame. I needed practice in pattern placement and that’s just what I got. I am now ready to take those skills to another level. It is already July and I’m busy on this month’s project.